Closing Date for Bursary Scheme extended. Apply Now. 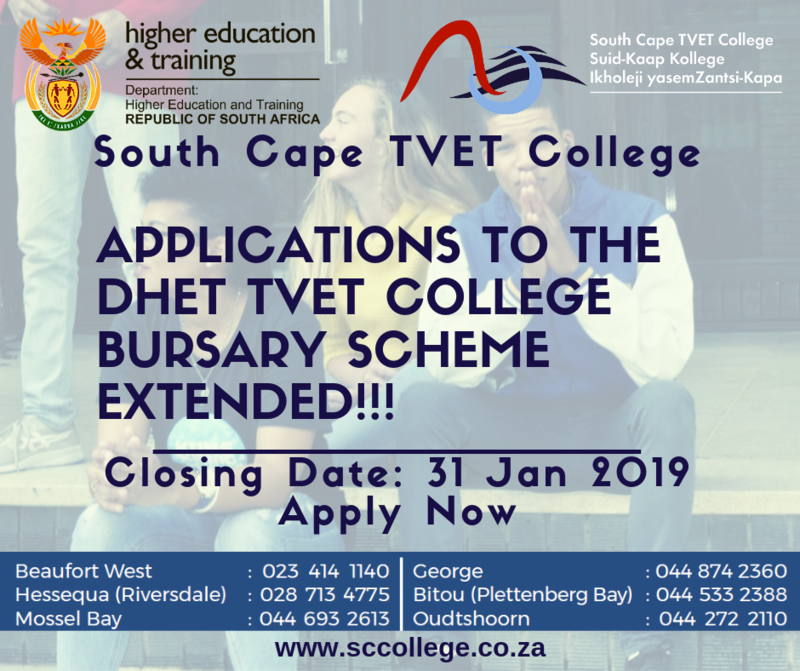 South Cape TVET College has extended Registration to 12 February 2019 in order to accommodate the positive response we have had with regards to enrollments. Applications for Bursaries and allowances will close on 31 January 2019. Bursaries cover tuition, accommodation, transport and living expenses are available to all academically deserving students in need of financial assistance. Families with a joint household income of R 350 000.00 or less are all eligible for financial aid. The College reserves the right to make the final decision; acceptance is subject to availability of funds. Education is the passport to the future, for tomorrow belongs to those who prepare for it today, and South Cape TVET College would like to assist youth of the Garden Route and beyond in preparing for their future today. Kindly share this information with all who will need it most, the future leaders of our country.